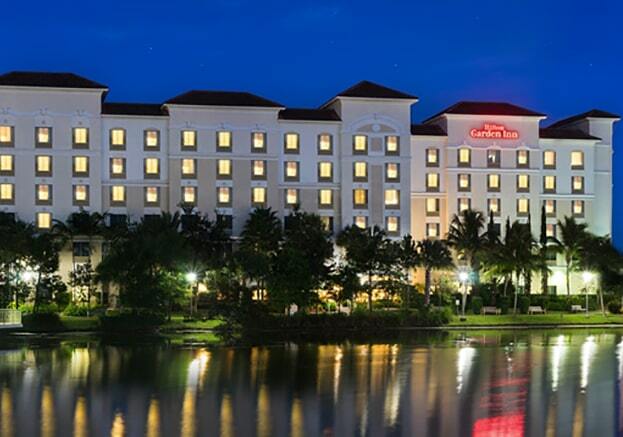 The Hilton Garden Inn Palm Beach Gardens is in an idyllic location in the heart of downtown at the Gardens on Lake Victoria. Guests can enjoy its short walk to the Gardens Mall with its numerous shops and eateries, as well as easy access to the over 100 world-class golf courses. Ideal for business travelers, there is a vibrant business district on PGA Boulevard that is just one block from the hotel—the 24/hour business center can also accommodate 175 guests and serves as a central location for meetings, celebrations and events. Amenities also include a lakefront swimming pool and whirlpool, lake walking trails and fitness center, as well as an onsite lakefront bar and restaurant.